WASHINGTON - July 6, 2018 - PRLog -- The Wisconsin Supreme Court has just ruled that a professor's use of his blog, even when utilized to bully and dox a student and to threaten other faculty members, is protected free speech even at a "private, Catholic, Jesuit university" which is not subject to the Constitution. 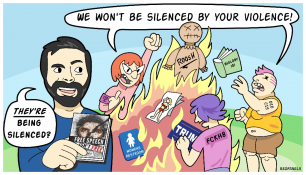 This is an important victory for free speech and academic freedom since it suggests that at all colleges and universities, not just those which are operated by the state, freedom of speech and academic freedom must be fully protected, even for speech which many would consider outrageous because it attacks a student and, according to the university,"intentionally expos[es] her name and contact information to a hostile audience that sent her vile and threatening messages." The minority opinion complained that the majority "fails to recognize, much less analyze, the academic freedom of Marquette as a private, Catholic, Jesuit university . . . As a result, it dilutes a private educational institution's autonomy to make its own academic decisions in fulfillment of its unique mission." But the high court ordered that political science professor John McAdams be reinstated with "unimpaired rank, tenure, compensation, and benefits"and awarded damages, finding that "the undisputed facts show that the University breached its contract with Dr. McAdams when it suspended him for engaging in activity protected by the contract's guarantee of academic freedom." Today's decision is especially noteworthy because the university tried to argue not just that the speech was "bullying" speech which was in fact very harmful and involved a subordinate, but that it violated so-called "professional standards of conduct." But this standards-of-conduct defense, which other universities have frequently resorted to, are vague and amorphous and almost never codified, and therefore are often used as all purpose tool for disciplining both faculty and students. But, as the court's decision helps establish, even these alleged standards cannot override the right of free speech protected by the Constitution at state colleges, and by contracts involving tenure and academic freedom even at private religious universities which may wish to impose their own very different standards.